Yes, this is the page mentioned in the National Post (Canada) on March 6th, 2000. However, a minor correction to their description of www.klaatu.org.... we are not an "unofficial official" web page, we are THE official web page for Klaatu as named by the three band members themselves. The Beatles supposedly recorded an album in mid 1966 that was to be a follow up to Revolver but the master tapes were mysteriously "lost" from the studio. The Beatles didn't want to re-record the album as Paul had (supposedly) just died in a car accident. When Billy Shears (a Paul McCartney look alike contest winner) stepped in to fill the space left by Paul's death, the Beatles stopped touring and recorded a new album that eventually turned out to be "Sgt. Pepper." This explains the long gap between Revolver and Sgt. Pepper and also the change in musical direction. Meanwhile, in 1975, the missing masters were uncovered during research for the Beatles' story project titled, The Long And Winding Road (which eventually became 1995's Beatles Anthology) and the band decided to release the album as a tribute to the late Paul McCartney. They decided on a release with no credit shown to songwriters and no photos so that the album would sell on the merits of the music contained therein and not on any "Beatles hype" (similar to Paul giving away a song to Peter and Gordon in the early 60s called "Woman" under the songwriting name of Bernard Webb). What were the clues that made people think that THIS album was the Beatles? 1. The record was on Capitol records, the American record company that had released most of the Beatles' records in the US. 2. The record had no names of band members listed on it anywhere. 3. The record had no producer name on it anywhere. It simply said, "Produced by Klaatu." 4. The record had no songwriter credits other than simply, "All selections composed by Klaatu." 6. CAPAC (see clue number 5) is the Canadian equivalent of America's ASCAP and Britain's BMI and John Lennon had recently been rumored to be moving to Toronto Canada since the US was trying to deport him. 7. The record had no pictures of band members on it anywhere. 8. On a couple of songs (Calling Occupants, Sub-Rosa Subway) the vocals sound like Paul McCartney & John Lennon. 9. The name Klaatu is taken from the movie "The Day The Earth Stood Still" in which the alien named Klaatu tells his robot Gort to stop hurting people with the command, "Klaatu barada niktu!" On Ringo Starr's Goodnight Vienna album Ringo is seen coming out of the spaceship from that movie and is standing next to Gort. 10. When Sgt. Pepper had been released, the inner sleeve showed Paul McCartney with a patch on his uniform which read O.P.D. Although many interpretations of this have come and gone, one of them was used in the Paul is dead myth, "Officially Presumed Dead". During the song Sir Bodsworth Rugglesby III on their first album, the lyrics state, "Officially Presumed Is Dead." Thanks to the outtakes of the Sgt. Pepper picture that are included with the CD we can now see that the patch says O.P.P. which stands for Ontario Provincial Police. Since John Lennon had been rumoured to be moving to Ontario, this fits the rumour that Klaatu was the Beatles quite nicely. 11. Capitol Records USA messed up a song title [does this surprise us?] on the original release, listing it as Sir Bodsworth Rubblesby III. This mistake carried onto their subsequent reissues until the first CD issue on Capitol which finally corrected this error. Says Crazy Ray, of WDRC (*see below*) in Waterbury, CT, "If you were to define Bods, Worth, Rubbles, and By, it would mean 'persons of importance born of quarry.' The Beatles were first known as the Quarrymen." 13. The song title, Sub-Rosa Subway was thought to be a take off on Paul's Red Rose Speedway. 14. In Sir Bodsworth Rugglesby III there is the line, "he's the only man who's ever been to hell and come back alive." Some people thought that this was a reference to the Paul is Dead rumor which states that Paul died in 1966 in a car crash and was replaced with a look-alike making it seem like he had come back alive. 15. While there are 8 trees pictured right at the very bottom of the front cover of the band's first album, only 7 have their roots showing. There are 7 letters in the name Beatles. 16. On the back cover of the first album is a two colored planet. Some took this to be an allusion to Paul's album, "Venus and Mars". 17. On Abbey Road the Beatles sing about the "Sun King". The Klaatu album covers all have a picture of the sun on them. 18. The initials for the Beatles last album, Abbey Road, are AR. If spelled backwards that becomes RA which is the name of the Egyptian god of the sun. See number 17 for the "sun" connection. 19. On the Sir Army Suit album is a song called Mr. Manson - it is about Charles Manson. Charles Manson is the mass murderer who claimed the Beatles were messengers from God sending messages to him directly. 22. The Beatles connection was confirmed in 1988 when the band reunited to record ONE new song called "Woman" which was an allusion to Paul's song that he had given to Peter and Gordon in the early 60s under a pseudonym and also to John's song Woman from his Double Fantasy album which was released just before his death. This song alledgedly contained an old John studio-recorded demo which had been added to by Billy Shears (as Paul McCartney), George Harrison & Ringo Starr. How did these rumors get started? A Providence, RI newspaper (The Providence Journal) ran an article by a rock music writer named Steve Smith which stated "Could Klaatu be the Beatles? Mystery is a Magical Mystery Tour." Smith concluded that Klaatu was more than likely in part or in whole the Beatles. Charlie Parker at WDRC(*see below*) in Hartford, CT said on air that it was, "a marvelous experience" to listen to this album and asked, "Who are Klaatu? Are the Beatles really back?" and suddenly Capitol records had to ship another 20,000 copies to that region of the country. All this led people to think this was the Beatles. If it wasn't them, then why not put their names and their pictures on it? The New Musical Express (a prominent music newspaper in England during the Beatles' time) ran an article with the headline, "Deaf idiot journalist starts Beatle rumour." But despite that and denials from the band (through spokesman Frank Davies) the rumor persisted and the band's album continued to sell in large quantities. In 1980 the band came out with it's 4th album (which also ended up being the last album released in the US by them) called Endangered Species. This time the album gave us some information. It said the songs were published by Klaatoons, but it told us that the album was produced by Christopher Bond. The songs also gave writing credit to Long, Woloschuk, and Tome. Were these the names of Klaatu members? There are three accepted definitions applied when describing the status of declining wildlife: rare, threatened and ENDANGERED SPECIES. The most recent figures published in the Red Data Book, as issued by the International Union for the Conservation of Nature and Natural Resources, indicate that there are at least 340 animals and 20,000 plants listed as endangered species. Experts throughout the world agree that unless immediate and effective measures are implemented to protect the existence of these life forms, their final outcome will inevitably be . . . extinction. So now we had songwriting credits to three people and a note from three people (2 of whom had been part of the songwriting credits). Are these the members of Klaatu? and there is no Beatles connection on their albums at all. by that name on that station because I grew up listening to Big D 103( wdrc ). There was, however, a dj in this area named Crazy Jerry Christopher. I believe he was on wdrc but I`ll have to double check on that detail. Anyway............I wrote to the station manager and this is what I got. btw.................I find his company name interesting. voice, but wouldn't have had a forum for making such comments. I'm quite sure there was never a Crazy Ray at Big D so I'm afraid I can't help you. My (Dave Bradley) response to this is that the information about Charlie Parker and Crazy Ray came from photocopies of newspaper and magazine articles that I have. The article dealing with Crazy Ray is shown below. I am still working on locating the original source of the Charlie Parker quote. The text of the "Crazy Ray" article appears below it's picture. Is Crazy Ray really crazy? If you had your radio tuned to WDRC on the evening of Tuesday, March 1, then you probably know the story behind Klaatu. For those of you who don't, Klaatu is believed to be the Beatles under a new name. According to "Crazy Ray," a spokesman for a Waterbury radio station, "Everybody knows that Klaatu, formerly Neutrino, is a five-man Canadian progressive rock group. The album was released early last summer. Klaatu is not the Beatles but was co-produced by John Lennon. The five guys are Goose Grahm - lead vocals and guitar (I heard he's Lennon's cousin, but I'm not sure), Andy Mills - lead guitar, John Spear - bass, vocals, John Tatum - keyboard, vocals, and Edward Satriano - drums. John Lennon plays guitar and sings background vocals on three songs, but none of the other Beatles are involved in any way whatsoever." When WDRC talked with Frank Davies, the official spokesman for Klaatu, he claimed that, "Crazy Ray is crazy." The album was published by Capitol Records Inc., the same company the Beatles used previously. Capitol Records is believed to have offered the Beatles a $150,000,000 contract to do another album. No one knows if this is the case. WDRC investigated the origin of the group. The name Klaatu derives from a 1951 science-fiction movie entitled, The Day The Earth Stood Still, and could mean "been here before." The film was also a theme of a previous Ringo Starr album, Good Night Vienna (sic). At a Paul McCartney concert last summer (now being viewed by Hall students on dial select) his final statement was, "I will see you when the earth stands still." There are many peculiarities about the album. For instance, there is a song entitled, Calling Occupants of Interplanetary Crafts (sic). This song mentions every planet in the solar system but Venus and Mars, which is the title of a previous best-selling Paul McCartney album. Another song on the album, Sir Bodsworth Rugglesby the Third is misspelled on the jacket as Rubblesby. If you were to define Bods, Worth, Rubbles and By, it would mean "persons of importance born of quarry". The Beatles were first known as "The Quarrymen." Subroads of Subways (sic) is a song that has a Morse code message intertwined with the lyrics. Capitol Records claims that when the code is deciphered it will reveal who the group is. When an official for DRC did that, it read, "The bugs are back." 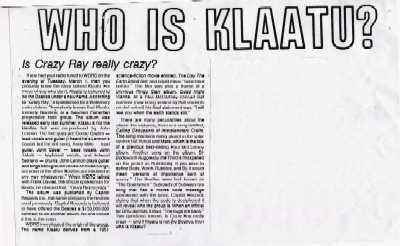 Two questions remain, is Crazy Ray really crazy - and if Klaatu is not the Beatles, then who is Klaatu? For an analysis of this article, click here. This page last updated on January 24, 2004. Special thanks to Dave Robson for further details of some of the Beatles rumor clues.